Autonomous maritime technology will change the world. Making maritime logistics the most efficient, safest and most sustainable transportation alternative. Research vessel Investigator is Australia’s only research vessel dedicated to blue-water research, and is owned and operated by CSIRO – Australia’s national science agency. The vessel conducts research year round, and is made available to Australian researchers and their international collaborators. Rising ocean temperatures have fueled some of the most devastating storms in recent years. Kendra Pierre-Louis, a reporter on The New York Times’s climate team, explains how. Researchers cannot say, however, that global warming is to blame for the specifics of the latest storm, Hurricane Michael, which grew to Category 4 with sustained winds of 155 miles an hour, as it hit the Florida Panhandle on Wednesday. Such attribution may come later, when scientists compare the real-world storm to a fantasy-world computer simulation in which humans did not pump billions of tons of carbon dioxide into the atmosphere. There are already tantalizing suggestions, however, that the warming caused by all those greenhouse-gas emissions has had an impact on Michael. A 2013 study showed that sea-surface temperatures in the eastern Gulf of Mexico have warmed over the past century by more than what would be expected from natural variability. These are the waters that the hurricane churned across as it headed toward the Panhandle and its maximum wind speeds more than doubled. “That general region has been one where there has been long-term climate warming,” said Thomas R. Knutson, a climate scientist with the National Oceanic and Atmospheric Administration and lead author of the study. While there is debate over whether global warming will lead to more frequent hurricanes — many models suggest there may actually be fewer in the future, although with a greater proportion of major ones — scientists are generally agreed about the effects of warming on intensity, as measured by wind speeds. “We have a very clear theory on how tropical cyclones intensify,” said Suzana J. Camargo, an ocean and climate physicist at Lamont-Doherty Earth Observatory in Palisades, N.Y. The theory, largely the work of Kerry Emanuel, a scientist at the Massachusetts Institute of Technology, holds that the temperature difference between ocean and upper atmosphere determines how much a storm intensifies. A bigger temperature difference leads to the release of more energy into the storm. “The warmer you have the ocean, the bigger the difference,” Dr. Camargo said. The theory has been reinforced by computer simulations that produce more intense storms with rising ocean temperatures. 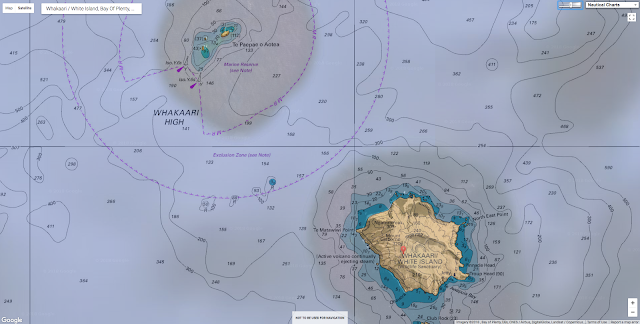 “We understand the theory behind it, and we have seen it in the models,” Dr. Camargo said. As for storms producing more precipitation, the Intergovernmental Panel on Climate Change has concluded that human-caused warming has affected the amount of water vapor in the air, and that extreme precipitation events have already increased in many parts of the world. The group’s latest report, issued this week, found that such extreme precipitation will likely further increase if the world cannot limit overall warming to 1.5 degrees Celsius (about 2.7 degrees Fahrenheit). As Hurricane Michael approached land on Wednesday, forecasters warned that the worst damage could come from a storm surge of as much as 13 feet. 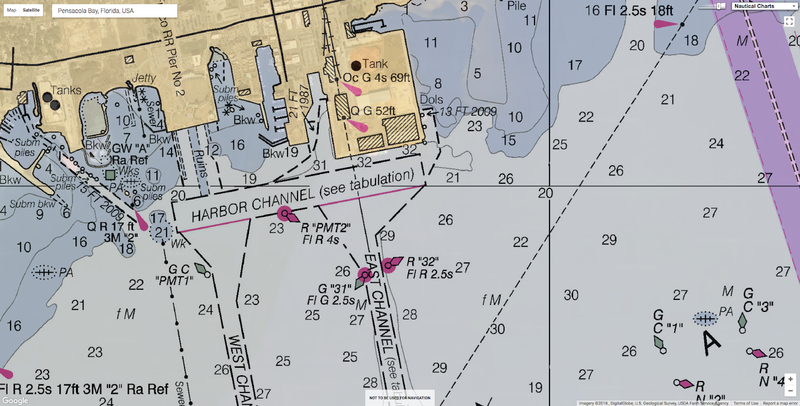 Florida, both along the Gulf and the Atlantic Ocean, is exceptionally vulnerable to storm surge, with strings of low-lying communities on the coasts and along waterways that are connected to the sea. Storm surge occurs when winds pile water up as it approaches land, and many factors — including the contours of the seafloor, topography of bays and inlets and the stage of the tide when the surge hits — can affect it. But rising sea levels can have an impact, too. “What’s not emphasized enough is the sea level-rise connection,” Dr. Camargo said. Seas are rising for two main reasons: water expands slightly as it warms, and glaciers and ice sheets add more water as they melt. But the rise can vary because of local factors like uplift or subsidence of the land. In the past four decades, global average sea levels have risen by about four inches. That may not seem like much, and in a 15-foot storm surge it may not add much to the destruction. “But we’re not talking about a few inches anymore by the end of the century,” Dr. Camargo said. Weather : Climate Change’s Influence on Hurricane Florence: a Wetter and Larger Storm? Forbes : What Is 'ACE' That Meteorologists Talk About During Hurricane Season? Previously hidden text on a 500-year old map reveals new clues about the cartographer’s sources and its influences on important maps that came later. Newly uncovered text opens a time capsule of one of history’s most influential maps. This 1491 map is the best surviving map of the world as Christopher Columbus knew it as he made his first voyage across the Atlantic. Much of the text on the 1491 map by Martellus map had faded to the point of illegibility (top), until researchers used modern imaging tools to uncover much of it (bottom). The map, created by the German cartographer Henricus Martellus, was originally covered with dozens of legends and bits of descriptive text, all in Latin. Most of it has faded over the centuries. in different combinations to reveal otherwise invisible features. These images show the southern tip of India on Martellus’s map. Invisible with regular light (left), a legend describing the panotii, a type of large-eared, part-human monster was revealed with multispectral imaging. This fragment of text on the Martellus map, revealed by multispectral imaging, appears to describe a porcupine that lives in a cave near the northern coast of Asia and throws its spines at men and dogs who hunt them. But now researchers have used modern technology to uncover much of this previously illegible text. Contrary to popular myth, 15th-century Europeans did not believe that Columbus would sail off the edge of a flat Earth, says Chet Van Duzer, the map scholar who led the study. But their understanding of the world was quite different from ours, and Martellus’s map reflects that. Its depiction of Europe and the Mediterranean Sea is more or less accurate, or at least recognizable. But southern Africa is oddly shaped like a boot with its toe pointing to the east, and Asia is also twisted out of shape. 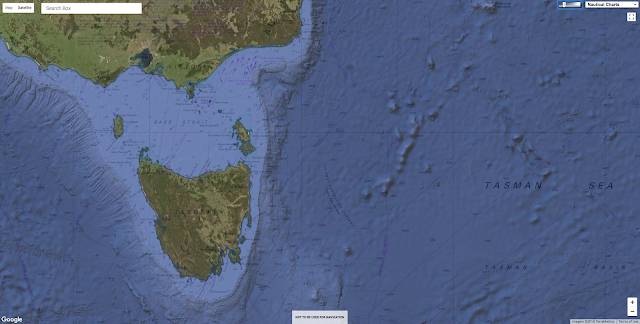 The large island in the South Pacific roughly where Australia can actually be found must have been a lucky guess, Van Duzer says, as Europeans wouldn’t discover that continent for another century. Martellus filled the southern Pacific Ocean with imaginary islands, apparently sharing the common mapmakers’ aversion to empty spaces. Another quirk of Martellus’s geography helps tie his map to Columbus’s journey: the orientation of Japan. At the time the map was created, Europeans knew Japan existed, but knew very little about its geography. Marco Polo’s journals, the best available source of information about East Asia at the time, had nothing to say about the island’s orientation. When Columbus made landfall in the West Indies on October 12, 1492, he began looking for Japan, still believing that he’d achieved his goal of finding a route to Asia. He was likely convinced Japan must be near because he’d travelled roughly the same distance that Martellus’s map suggests lay between Europe and Japan, Van Duzer argues in a new book detailing his findings. 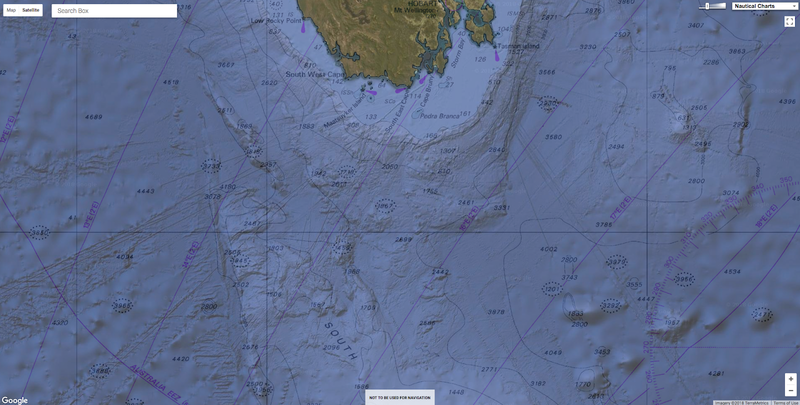 Van Duzer says it’s reasonable to speculate that as Columbus sailed down the coast of Central and South America on later voyages, he pictured himself sailing down the coast of Asia as depicted on Martellus’s map. and cities of southern Africa on Martellus’s map. The map is roughly 3.5 by 6 feet. Such a large map would have been a luxury object, likely commissioned by a member of the nobility, but there’s no shield or dedication to indicate who that might have been. It was donated anonymously to Yale University in 1962 and remains in the university’s Beinecke Rare Book & Manuscript Library. Over time, much of the text had faded to almost perfectly match the background, making it impossible to read. But in 2014 Van Duzer won a grant from the National Endowment for the Humanities that allowed him and a team of collaborators to use a technique called multispectral imaging to try to uncover the hidden text. The method involved taking many hundreds of photographs of the map with different wavelengths of light and processing the images to find the combination of wavelengths that best improves legibility on each part of the map. Many of the map legends describe the regions of the world and their inhabitants. “Here are found the Hippopodes: they have a human form but the feet of horses,” reads one previously illegible text over Central Asia. Another describes “monsters similar to humans whose ears are so large that they can cover their whole body.” Many of these fantastical creatures can be traced to texts written by the ancient Greeks. The most surprising revelation, however, was in the interior of Africa, Van Duzer says. Martellus included many details and place names that appear to trace back to an Ethiopian delegation that visited Florence in 1441. Van Duzer says he knows of no other 15th-century European map that has this much information about the geography of Africa, let alone information derived from native Africans instead of European explorers. “I was blown away,” he says. The imaging also strengthens the case that Martellus’s map was a major source for two even more famous cartographic objects: the oldest surviving terrestrial globe, created by Martin Behaim in 1492, and Martin Waldseemuller’s 1507 world map, the first to apply the label “America” to the continents of the western hemisphere. Waldseemuller liberally copied text from Martellus, Van Duzer found after comparing the two maps. The practice was common in those days—in fact, Martellus himself apparently copied the sea monsters on his map from an encyclopedia published in 1491, an observation that helps date the map. Despite their commonalities, the maps by Martellus and Waldseemuller have one glaring difference. Martellus depicts Europe and Africa nearly at the left edge of his map, with only water beyond. Waldseemuller’s map extends further to the west and depicts new lands on the other side of the Atlantic. Only 16 years had passed between the making of the two maps, but the world had changed forever. Martellus’s map shows it running north-south. Correct, but almost certainly another lucky guess says Van Duzer, as no other known map of the time shows Japan unambiguously oriented this way. Columbus’s son Ferdinand later wrote that his father believed Japan to be oriented north-south, indicating that he very likely used Martellus’s map as a reference. 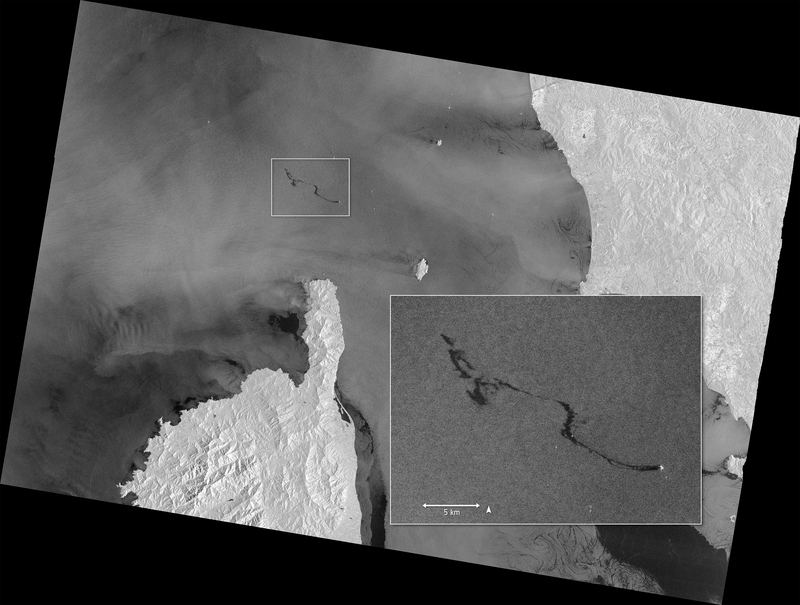 The Copernicus Sentinel-1 mission has imaged the oil spill in the Mediterranean following a collision between two merchant ships on Sunday 7 October 2018. A Tunisian cargo ship is reported to have struck the hull of a Cypriot container ship in waters north of the French island of Corsica. 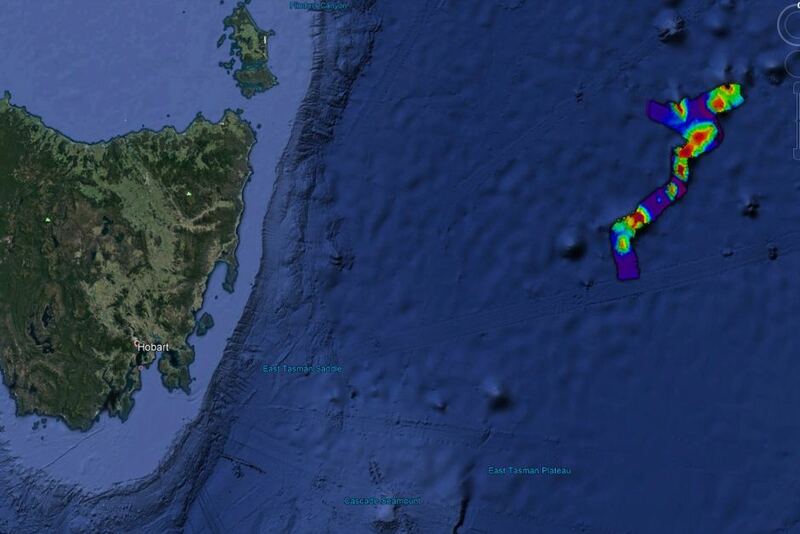 There were no casualties, but the collision caused a fuel leak – which has resulted in an oil slick about 20 km long. 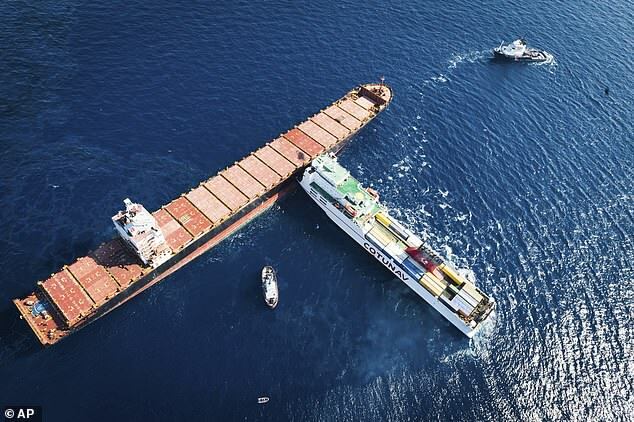 Although the collision occurred in French waters, the cleanup operation is part of a joint pact between France, Italy and Monaco to address pollution accidents in the Mediterranean. This image of the slick, which can be seen as a dark patch north of the tip of Corsica, was captured by the Sentinel-1A satellite today at 05:28 GMT (07:28 CEST). Sentinel-1 is a two-satellite constellation built for the European Commission’s Copernicus environmental monitoring programme. The identical satellites each carry an advanced radar instrument that can ‘see’ through the dark and through clouds. Its wide swath allows large areas of Earth’s surface to be imaged so that events such as this can be detected and monitored easily. Sentinel-1 images are used by the European Maritime Safety Agency as part of CleanSeaNet, the European satellite-based oil spill and vessel detection service. 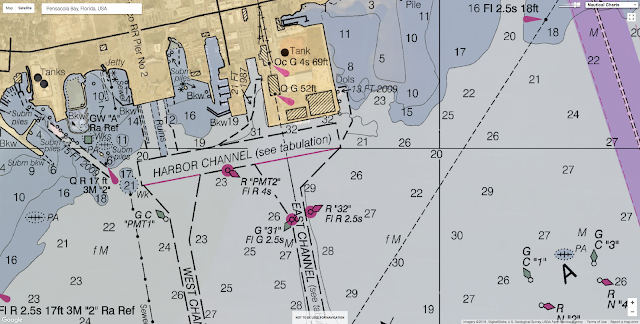 Note: other dark areas show patterns featuring low reflectivity of the radar signal, for instance very calm waters. 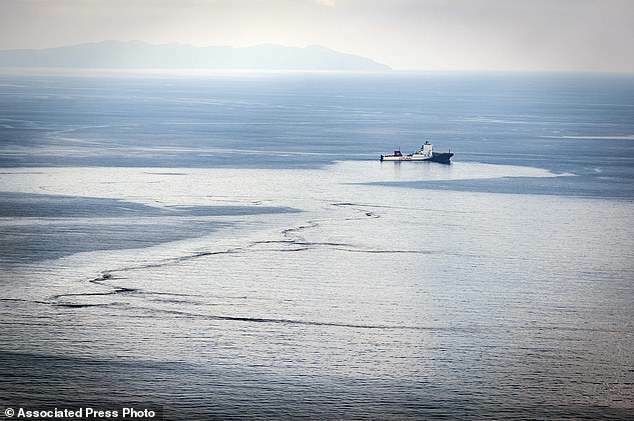 French and Italian maritime authorities have begun cleaning up a fuel spill that has spread 12.5 miles in the Mediterranean Sea after two cargo ships collided north of the island of Corsica. The incident occurred early Sunday when The Ulysse, a Tunisian freighter operated by CTN, rammed into a Cyprus-based CLS Virginia, which was anchored about 20 miles off the northern tip of the French island and not carrying any cargo. The ship's hull was pierced and at least one fuel tank began leaking into the sea off the holiday island of Corsica. Italy's coast guard said yesterday it is recovering some of the polluted material and monitoring the spill amid changing weather conditions. According to the CTN's published shipping schedule, the Ulysse was travelling from Genoa in Italy to the Tunisian port at Rades near Tunis. French Environment Minister Francois de Rugy said some 600 tonnes of propulsion fuel had spilled into the sea. He condemned the 'abnormal behaviour' of the Tunisian ship in a press briefing at Corsica's Bastia airport after surveying the affected area by helicopter. Officers of France's paramilitary gendarme police force had been airlifted to the ships to investigate the incident, but it was too early to say what had happened, he added. 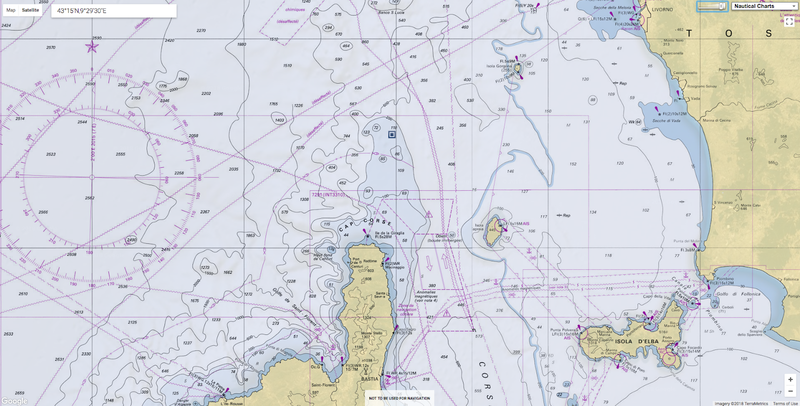 Italian anti-pollution vessels have begun pumping the slick, Rugy said, adding that while the collision occurred near the Cap Corse marine reserve, the spill remained outside the park and moving away from Corsica. The island is known for its pristine waters and beaches. Aerial views of the area by Falcon 50 @NationalMarine this morning. French and Italian resources (including Italian tugboat Our Taurus in photo) on site to start treating pollution ribbon. 'All means are mobilised, civil and military teams, French and Italian are working hard and doing everything so that this accident does not have ecological consequences,' he said. 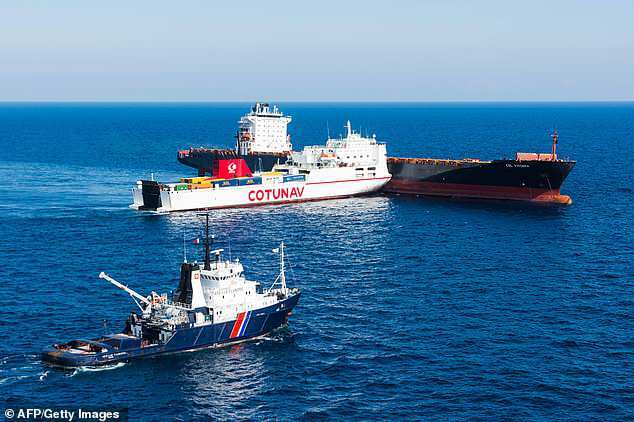 'The first priority is to extricate the two boats,' Rugy said, adding the operation was 'very complicated', with the Tunisian boat wedged into the Cyprus-based CLS Virginia. A criminal investigation has been launched for 'pollution' brought on by a 'maritime accident', Marseille prosecutor Xavier Tarabeux said. Writing on Twitter, Corsica leader Gilles Simeoni said earlier he was determined to find what caused the accident, which occurred in relatively calm seas with good visibility. The IPCC_CH report on GlobalWarming of 1.5°C is one of the most important climate change reports ever published. Limiting temperature increase requires unprecedented changes in society, but will have huge benefits. 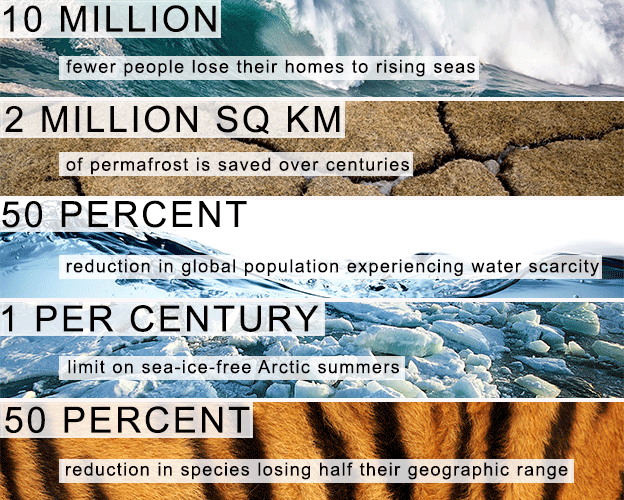 Every half a degree of warming matters. A heat map showing how temperatures are soaring across the planet. “It’s a line in the sand and what it says to our species is that this is the moment and we must act now,” said Debra Roberts, a co-chair of the working group on impacts. Policymakers commissioned the report at the Paris climate talks in 2016, but since then the gap between science and politics has widened. Donald Trump has promised to withdraw the US – the world’s biggest source of historical emissions – from the accord. The first round of Brazil’s presidential election on Sunday put Jair Bolsonaro into a strong position to carry out his threat to do the same and also open the Amazon rainforest to agribusiness. The world is currently 1C warmer than preindustrial levels. Following devastating hurricanes in the US, record droughts in Cape Town and forest fires in the Arctic, the IPCC makes clear that climate change is already happening, upgraded its risk warning from previous reports, and warned that every fraction of additional warming would worsen the impact. Scientists who reviewed the 6,000 works referenced in the report, said the change caused by just half a degree came as a revelation. “We can see there is a difference and it’s substantial,” Roberts said. At 1.5C the proportion of the global population exposed to water stress could be 50% lower than at 2C, it notes. Food scarcity would be less of a problem and hundreds of millions fewer people, particularly in poor countries, would be at risk of climate-related poverty. But the greatest difference would be to nature. Insects, which are vital for pollination of crops, and plants are almost twice as likely to lose half their habitat at 2C compared with 1.5C. Corals would be 99% lost at the higher of the two temperatures, but more than 10% have a chance of surviving if the lower target is reached. Sea-level rise would affect 10 million more people by 2100 if the half-degree extra warming brought a forecast 10cm additional pressure on coastlines. The number affected would increase substantially in the following centuries due to locked-in ice melt. Oceans are already suffering from elevated acidity and lower levels of oxygen as a result of climate change. One model shows marine fisheries would lose 3m tonnes at 2C, twice the decline at 1.5C. A nearly ice-free Northwest Passage in the Arctic in August 2016. Time and carbon budgets are running out. By mid-century, a shift to the lower goal would require a supercharged roll-back of emissions sources that have built up over the past 250 years. The IPCC maps out four pathways to achieve 1.5C, with different combinations of land use and technological change. Reforestation is essential to all of them as are shifts to electric transport systems and greater adoption of carbon capture technology. Carbon pollution would have to be cut by 45% by 2030 – compared with a 20% cut under the 2C pathway – and come down to zero by 2050, compared with 2075 for 2C. This would require carbon prices that are three to four times higher than for a 2C target. But the costs of doing nothing would be far higher. “We have presented governments with pretty hard choices. We have pointed out the enormous benefits of keeping to 1.5C, and also the unprecedented shift in energy systems and transport that would be needed to achieve that,” said Jim Skea, a co-chair of the working group on mitigation. “We show it can be done within laws of physics and chemistry. Then the final tick box is political will. He said the main finding of his group was the need for urgency. Although unexpectedly good progress has been made in the adoption of renewable energy, deforestation for agriculture was turning a natural carbon sink into a source of emissions. Carbon capture and storage projects, which are essential for reducing emissions in the concrete and waste disposal industries, have also ground to a halt. In the run-up to the final week of negotiations, there were fears the text of the report would be watered down by the US, Saudi Arabia and other oil-rich countries that are reluctant to consider more ambitious cuts. The authors said nothing of substance was cut from a text. The report will be presented to governments at the UN climate conference in Poland at the end of this year. But analysts say there is much work to be done, with even pro-Paris deal nations involved in fossil fuel extraction that runs against the spirit of their commitments. Britain is pushing ahead with gas fracking, Norway with oil exploration in the Arctic, and the German government wants to tear down Hambach forest to dig for coal. At the current level of commitments, the world is on course for a disastrous 3C of warming. The report authors are refuseing to accept defeat, believing the increasingly visible damage caused by climate change will shift opinion their way. “I hope this can change the world,” said Jiang Kejun of China’s semi-governmental Energy Research Institute, who is one of the authors. “Two years ago, even I didn’t believe 1.5C was possible but when I look at the options I have confidence it can be done. 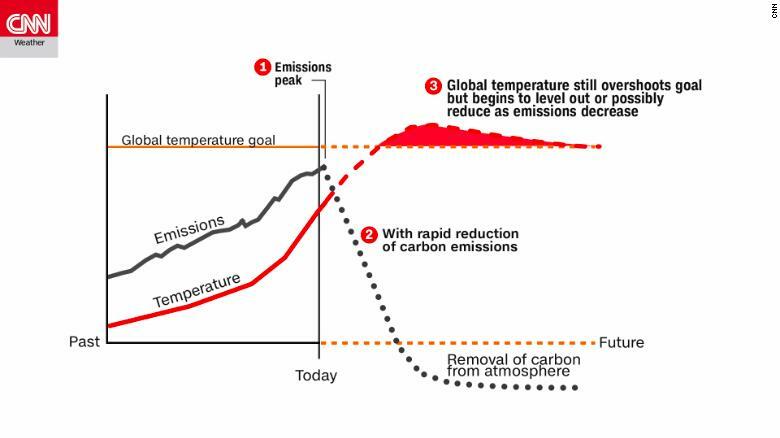 This chart from the IPCC shows how global temperatures would respond to a sudden and drastic reduction of greenhouse gas emissions. Even with immediate action, global temps will still overshoot the goal, but could reduce back to the target over time. The timing was good, he said, because the Chinese government was drawing up a long-term plan for 2050 and there was more awareness among the population about the problem of rising temperatures. “People in Beijing have never experienced so many hot days as this summer. Regardless of the US and Brazil, he said, China, Europe and major cities could push ahead. “We can set an example and show what can be done. James Hansen, the former Nasa scientist who helped raised the alarm about climate change, said both 1.5C and 2C would take humanity into uncharted and dangerous territory because they were both well above the Holocene-era range in which human civilisation developed. But he said there was a huge difference between the two: “1.5C gives young people and the next generation a fighting chance of getting back to the Holocene or close to it. Johan Rockström, a co-author of the recent Hothouse Earth report, said scientists never previously discussed 1.5C, which was initially seen as a political concession to small island states. But he said opinion had shifted in the past few years along with growing evidence of climate instability and the approach of tipping points that might push the world off a course that could be controlled by emissions reductions. “Climate change is occurring earlier and more rapidly than expected. 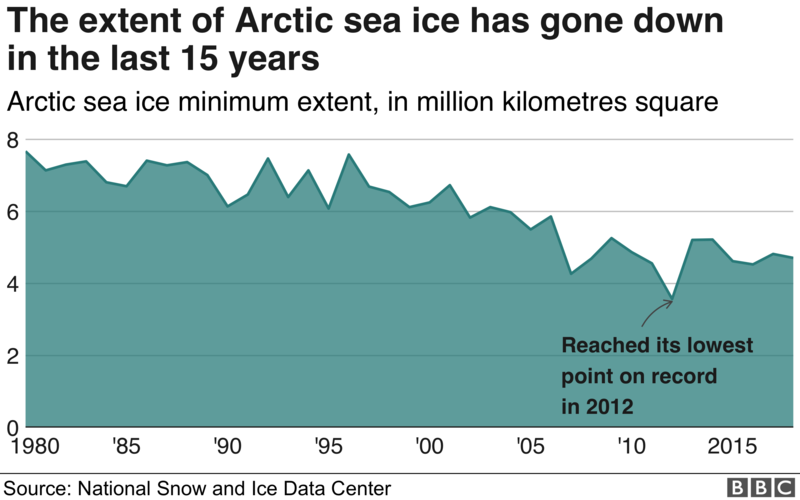 Even at the current level of 1C warming, it is painful,” he told the Guardian. “This report is really important. It has a scientific robustness that shows 1.5C is not just a political concession. Phys : Climate changing faster than feared, but why are we surprised? One of the first things I ever wrote for publication was a short article about drowning recognition for a Coast Guard magazine. A few years later, I adapted the piece for recreational boaters. I tried my best to get it published, but no one wanted it. Reader’s Digest said it was “too dark,” and everyone else (including Soundings magazine) simply ignored the submission. Thanks to a friend of mine who had a blog, my piece on drowning was first posted eight years ago to the day in 2010. It went viral and crashed his website. Since then, it’s been translated into 15 languages, was published in the Washington Post, and Reader’s Digest eventually requested to buy the rights. After years of saying yes to requests to republish, repost and translate (there have been hundreds), I released the piece to the public domain. But I never got the article into a major boating magazine as I intended. Well, this is my blog, so I like my chances this time. Summer is coming, folks, and I think the short article below is the most valuable thing I’ve put together, ever. I wanted to make sure followers of this blog have read it. The new captain jumped from the deck, fully dressed, and sprinted through the water. A former lifeguard, he kept his eyes on his victim and headed straight for a couple who were swimming between their anchored sportfish and the beach. “I think he thinks you’re drowning,” the husband said to his wife. They had been splashing each other, and she had screamed, but now they were just standing neck-deep on a sandbar. “We’re fine, what is he doing?” she asked, a little annoyed. “We’re fine!” the husband yelled, waving him off, but his captain kept swimming hard toward him. “Move!” he barked as he sprinted between the stunned owners. Directly behind them, not 10 feet away, their nine-year-old daughter was drowning. How did this captain know — from 50 feet away — what the father couldn’t recognize from just 10? Drowning is not the violent, splashing call for help that most people expect. The captain was trained to recognize drowning by experts and years of experience. The father, on the other hand, learned what drowning looks like by watching television. If you spend time on or near the water (hint: that’s all of us), then you should make sure that you and your crew know what to look for when people enter the water. Until she cried a tearful, “Daddy,” the owner’s daughter hadn’t made a sound. As a former Coast Guard rescue swimmer, I wasn’t surprised at all by this story. Drowning is almost always a deceptively quiet event. The waving, splashing and yelling that dramatic conditioning (television) prepares us to look for is rarely seen in real life. The average temperature of British and Irish coastal waters is 12- 15ºC, cold enough to cause cold water shock. Professor Mike Tipton, leading expert in cold water survival at the University of Portsmouth, talks about what you should do if you find yourself unexpectedly in cold water. The Instinctive Drowning Response, so named by Francesco A. Pia, Ph.D., is what people do to avoid actual or perceived suffocation in the water. And it does not look like most people expect it to. When someone is drowning there is very little splashing, and no waving or yelling or calling for help of any kind. To get an idea of just how quiet and undramatic drowning can be, consider this: It is the number two cause of accidental death in children age 15 and under (just behind vehicle accidents). Of the approximately 750 children who will drown next year, about 375 of them will do so within 25 yards of a parent or other adult. In 10 percent of those drownings, the adult will actually watch them do it, having no idea it is happening. Except in rare circumstances, drowning people are physiologically unable to call out for help. The respiratory system was designed for breathing. Speech is a secondary or overlaid function. Breathing must be fulfilled before speech occurs. Drowning people’s mouths alternately sink below and reappear above the surface of the water. The mouths of drowning people are not above the surface of the water long enough for them to exhale, inhale and call out for help. When the drowning people’s mouths are above the surface, they exhale and inhale quickly as their mouths start to sink below the surface of the water. Throughout the Instinctive Drowning Response, drowning people cannot voluntarily control their arm movements. Physiologically, drowning people who are struggling on the surface of the water cannot stop drowning and perform voluntary movements such as waving for help, moving toward a rescuer or reaching out for a piece of rescue equipment. This doesn’t mean that a person who is yelling for help and thrashing isn’t in real trouble — they are experiencing aquatic distress. Not always present before the instinctive drowning response, aquatic distress doesn’t last long, but unlike true drowning, these victims can still assist in their own rescue. They can grab lifelines, reach for throw rings, etc. So, if a crewmember falls overboard and everything looks okay, don’t be too sure. Sometimes the most common indication that someone is drowning is that they don’t look as if they’re drowning. They may just look as if they are treading water and looking up at the deck. One way to be sure? If they can answer at all, they probably are. If they return a blank stare, you may have less than 30 seconds to get to them. And parents — children playing in the water make noise. When they get quiet, you need to get to them and find out why.